Gurugram: The exercise on running a pod taxi / metrino services in the city has been started. For this, three companies have submitted their bids to the National Highway Authority of India (NHAI). Work on this project will start after the bid is finalized. It has to be completed within one year of commencement of work. Initially, work will be started under pilot project to build the route and station for about 12 km in the city from Delhi-Gurgaon border. The stations have also been marked for this. However, the entire project of Pod Taxi has been set up from Delhi’s Dhola Kuan to Manesar. Union Road Transport Minister Nitin Gadkari said that the work of running a pod taxi from Delhi’s Dhola Kuan to Manesar will also start in the next one and a half months. This is his dream project. If people get access to the taxi in the air, then the road will get lesser on the road. At the same time he had talked for encouraging people to use public transport instead of using their personal vehicle. Union Road Transport Minister Nitin Gadkari said that the work of running a pod taxi from Delhi’s Dhola Kuaa to Manesar will also start in the next one and a half months. This is his dream project. If people get access to the taxi in the air, then the road will get lesser on the road. At the same time he had talked for encouraging people to use public transport instead of using their personal vehicle. 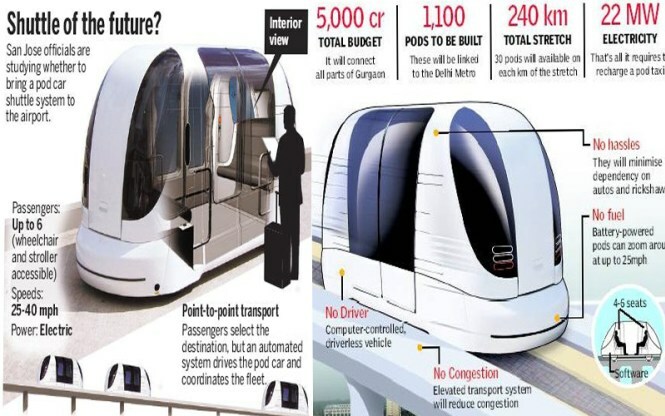 The work on Delhi-Gurugaon Pod Taxi corridor will be carried on Public Private Partnership (PPP mode) as a pilot project and the construction work will be done in 12.30 km area from Delhi-Gurgaon border to the city’s Rajiv Chowk. Union Road Transport Minister Nitin Gadkari named the project as ‘Personal Rapid Transit‘ (PRT). About 4 thousand crore rupees will be spent on this project. Responding to RTI activist Aseem Takiyar under the Right to Information, NHAI said that work on Pod Taxi plan has begun. In the month of March, EOI (Expression of interest) was sought and in three bids were received. NHAI refused to expose the names of these three bidders to public at this stage. PRT is a automated electric pod car which looks like a taxi. This is called non-pollution and traffic free technique. According to an NHAI official, the PRT car will be clean, pollution free service without extra burden on people’s pockets. Sources said that there is a plan to run 800 to 1100 pod taxies / PRT cars in the first year, so that 38 thousand people can travel in one hour. According to earlier plan, the initial stations of pod taxies will be Udyog Vihar, Cyber ​​City, Shyam Chowk, Atlas Chowk, Sector-25 IFFCO Chowk, Signature Tower, Sector-31, Jharsa Chowk, Rajiv Chowk, Tau Devi Lal Stadium, Sector-38, and Sector-47.